Latest in the Happy Saints eBook series! 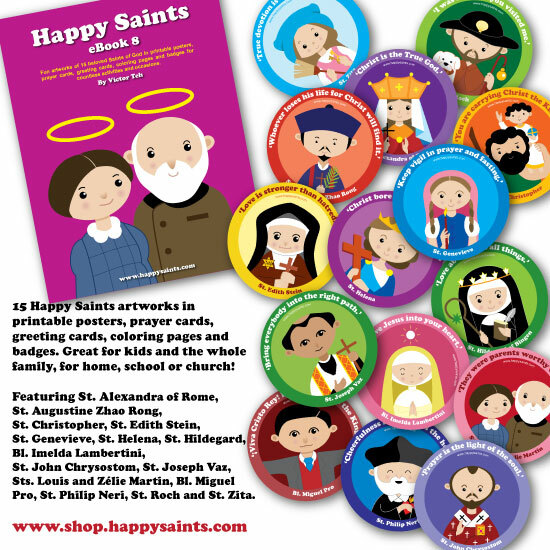 15 new cartoon artworks of beloved Catholic Patron Saints in printable posters, prayer cards, greeting cards, coloring pages and badges. Great for kids and the whole family, for home, school or church! Featuring St. Alexandra of Rome, St. Augustine Zhao Rong, St. Christopher, St. Edith Stein, St. Genevieve, St. Helena, St. Hildegard, Bl. Imelda Lambertini, St. John Chrysostom, St. Joseph Vaz, Sts. Louis and Zélie Martin, Bl. Miguel Pro, St. Philip Neri, St. Roch and St. Zita.